Visions of Jesus Christ.com - Tear fall from Our Lady at orphanage chapel near Medjugorje. 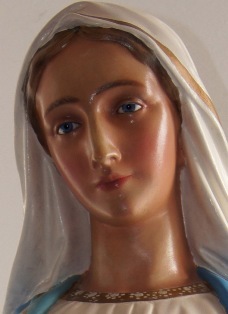 Reported June 5, 2012 from [spiritofmedjugorje.org] - Subscriber Susan Sisler sent us this photo which appears to show tears coming from Our Lady's eyes. Dr. Christina DeSantos, M.D., from Texas took the photo on November 8, 2011. The statue is in the chapel at Sister Kornelija's orphanage in the village of Vionica, near Medjugorje.